You’ve worked hard to build a successful business. Throughout the years there were many sleepless nights and client meetings, and long hours spent developing new products and pouring over financial statements. Today, new opportunities might be calling or maybe you just want to rest easy and reap the rewards of years of hard work. Whatever the reason, you feel it’s time to pass the torch. But simply deciding to close this chapter doesn’t mean the end of the adventure just yet! Having a successful exit and succession plan requires careful planning, without which the whole process can go off the rails. 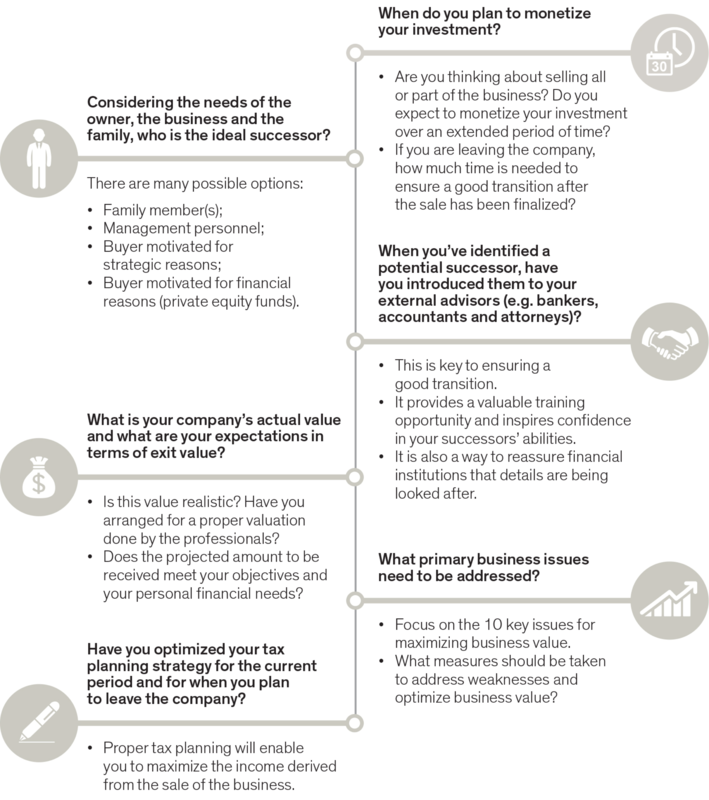 Before beginning the succession planning process, certain things must be clarified with your successors and your business advisors. Use your network of contacts. Hire a professional with extensive transaction experience. This document will be used to present the company to potential buyers, indicating its value. Highlight the company’s principal value drivers. Indicate trends in terms of financial results, e.g., sales, EBITDA, adjustments, targeted net working capital. This step can be part of a formal or informal process. The letter of intent should address the following issues: price, shares, assets or hybrid structure, net working capital, period of exclusivity, and closing conditions. Plan financial, legal and tax transactions with the help of your advisor. The purchase agreement must set out the price, any non-cash considerations, representations and warranties, and limitations of the liability exemption clause. It is extremely important to have a good advisor for any business transactions in the succession planning process. This person must be able to provide extensive and objective financial and business expertise in accordance with your needs. A company’s objectives and concerns change frequently, as does the manner in which it operates. Your advisor must be committed to meet with you regularly to ensure that decisions are being made based on the most recent information so that you receive practical and knowledgeable advice. At Richter, our approach to understanding each client’s business is comprehensive while at the same time tailored to specific needs. We take the time to understand your objectives and concerns whether you are a shareholder, a manager or operator within the company, or a family member who wants to generate wealth for future generations, (regardless of whether or not they are actively involved in the business). Our service model involves a comprehensive and integrated approach, going beyond professional offerings. In effect, we become a natural extension of our clients’ businesses.